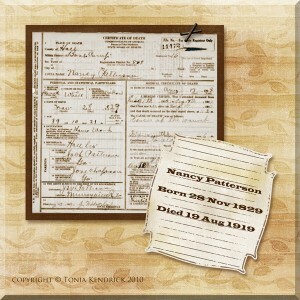 I recently located the death certificate for Nancy Patterson, my third great grand-aunt. This was a good find, providing new information as well as primary or secondary source citations for certain facts that I already knew. Marital Status: Widow – note: Nancy’s maiden name is Patterson and apparently her married name is, as well. Informant: J. V. Patterson – this may be her son. Check Hall County Marriage Records. Check Hall County Cemetery Records. Source: Hall County, Georgia, Death Certificates, no. 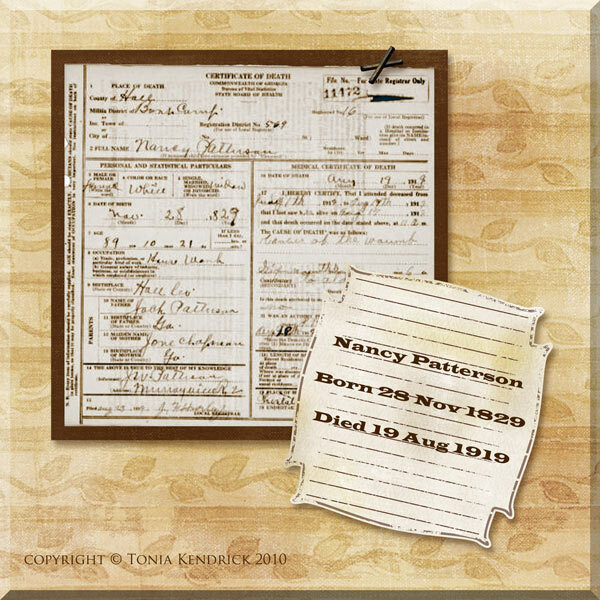 11172, Nancy Patterson, 1919; digital images, Georgia Archives, Georgia Death Certificates, 1919-1927 (http://cdm.sos.state.ga.us/cdm4/gadeaths.php : accessed 25 September 2010). I am researching the line of Samuel Patterson and Nancy Patterson, his wife and first cousin. I need documentation for a DAR application that Samuel was the son of Wm Patterson and Martha Welch. All are buried in Chestatee Cemetery in Hall County, GA. Photos of graves are on Find A Grave. If you are unable to help me, feel free to forward this not to someone else that might. Thank you for your time. An old Bible or church record would be great! I’m sorry, I don’t have any information on him. In fact, I didn’t know who Nancy’s husband was until this comment, so thank you. The DAR application was approved a couple of years ago. Since then, the lady has become very ill, moved back to GA and become inactive with DAR. It looks like you don’t have this either on Nancy’s husband…sharing. Thanks Linda! I only had one child belonging to Samuel’s parents, William and Martha, so this certainly helps to flesh out the tree. Samuel was the oldest sibling and of course, there was about a dozen of them in that time period!!! I don’t have the file with me tonight, but will get the actual documentation for your site later. Both the Chapman and Patterson goes back to a proven DAR patriots. Have you ever thought about joining? Thanks, Linda. I did not know that the Pattersons and Chapmans went back to proven patriots. I have several other proven patriots in my ancestry. I have considered joining the DAR and actually have most of my paperwork ready. I can’t seem to hook up with the local chapter, though. The only time they’ve ever given me a meeting date, it was a lunch meeting with one day’s notice and I had work conflicts. I seem to remember reading one time that there was a way to join at the state level, without going through a chapter. Do you know if that’s true? Hi Linda, I’m doing some research in the DAR online database. Can you tell me the names of the Chapman and Patterson patriots? Hi Kathy, I don’t believe that I did. I don’t have any record of it in my database. Did she give you an email add. I would like to ask her about the Chapman & Patterson patriots. Also, where did you find Nancy’s death cert. Is it online? Thank You for all your work. You’ve done a great job! Hope you see this. Could you please tell us the names of your Chapman and Patterson patriots, and the source for John Patterson’s DOB (08 Feb 1750)? You can join nationally without going through a chapter…it is called member-at-large. The National Society of Daughters of the American Revolution website would have information on that. I could ask about you joining my chapter and then transferring to your local later. That might be easier. Do you know the name of your local chapter? RE Informant: J. V. Patterson – this may be her son. I think this is correct: John Wm. Patterson born May 10, 1856 in Hall Co, GA was her son so that is J. W. Patterson instead of J. V. John married Eliza Ann Mauldin. He died in Atlanta in 1942. Thanks, Linda! Both for the Patterson info and DAR info. My local chapter is the Robert Loughridge chapter in Chatsworth, GA.
My chapter is the Amelia Island (FL) Chapter. I emailed the registrar about you earlier as I forward Nancy’s death certificate to her. I am so enjoying your website Tonia. I, too, have started the process of joining the DAR. Our common ancestors include the Whiteners (Weidner) and Powells. Good luck in your DAR membership. I have found your website very helpful and enjoy your blogs and posts. Are you on Gedmatch? I have both Patterson and Chapman DNA connections. Hi John, yes I am on Gedmatch. I’ll look for your kit. I have Powells, also, just FYI. Both paper and DNA connections.